If you’re living in Lebanon you need to know the right people to get ahead, but in Uganda, sheer luck is important. That’s what people in those countries say are the keys to success. A Pew report released Thursday reached the conclusion that people in developing economies are more likely to think the next generation will be better off than this one. That’s interesting enough, but the detailed responses Pew collected in 44 countries this summer reveal something deeper about how people around the world view autonomy and success. It’s slightly confusing, because the statement is already framed in the negative — so respondents who disagreed (i.e. 57 percent of Americans and 62 percent of Venezuelans) were actually expressing a positive view about their ability to determine their own success. At the other extreme were respondents in Pakistan, only 18 percent of whom disagreed with the statement that life is determined by outside forces. Pew found that less-developed countries tended to be more optimistic, so I was curious to see if people’s beliefs about how to secure success also varied by their countries’ wealth. I took the 10 richest and the 10 poorest countries that Pew interviewed (as measured by their 2013 GDP per capita) and looked at whether there were any trends in what people believe affects their success. From “hard work” to “being lucky,” respondents were asked to assess each factor and assign it a score from 0 to 10, where 0 meant that it was “not important at all” and 10 indicated it was “very important” in order to get ahead in life. People in developing economies were far more likely to say that “having a good education” and “working hard” were 10/10 in terms of importance. That appears to be something of a paradox, since many respondents in those same countries also claimed that “giving bribes” and “being lucky” were very important. Although people in wealthy countries also think diligence and education are important, a smaller share of respondents gave those factors top marks in determining their lives. 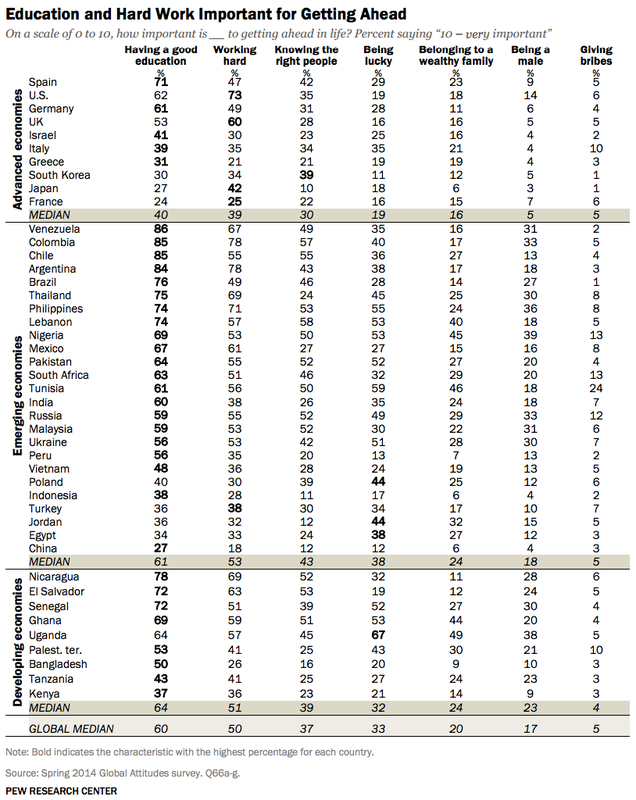 The full findings are available from Pew here, but the table reproduced below offers a summary of how individuals in different countries feel about the forces that shape their future success.